A miscellany of history and stories associated with yachting in the Wellington region. Psyche was built by Ernie Lane - a somewhat unsung boatbuilder - in Picton. I haven't got a date for her launch. In 1926 she sailed to from Wellington to Sydney. It became something of a legendary journey, as it was reasonably rare in those days for such small private vessels to make the trip. There was definitely a lot of action, as the surviving account tells. I don't know anything about the crew members, except Archie Scott. Archie was a plumber who worked at the Evans Bay patent slip. He owned various boats, over the years, including the Le Huquet Ailsa. He converted Ailsa briefly to a bermuda rig in the early 1920s but it didn't work very well, and after a season or two returned her to a gaff configuration. He went on to design many vessels from the 1930s to the 1960s. Many of which, including Ocean Maid and Maranui, were very successful, and still sailing today. He also did a lot of work in designing new sail plans. A good collection of his work can be found at the Wellington Museum of City and Sea. I'll write a post about him in the new year. The account below was published in "The Yachtsman", a magazine put out by the Evans Bay Yacht and Motor Boat Club during the late 1930s. The story was serialised over three issues (reprinted from and Australian boating magazine). Part one is below, from Volume 2, iss. 2. October 1936. I'll load up the other two this week if I have time. 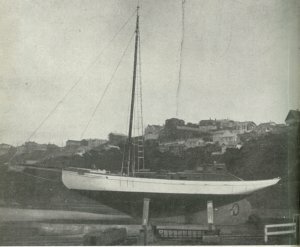 Although it is ten years ago since the cutter rigged auxiliary yacht “Psyche” slipped quietly away from her Wellington moorings on her great voyage to Sydney, her crossing is still a very interesting topic to New Zealand boatmen as one of the epics in the history of New Zealand yachting. 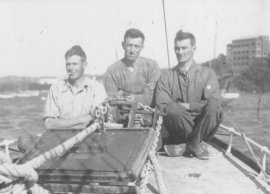 The crew, F. C. Townsend, Redvere Quinlan (engineer), Archie Scott and Les Thompson (A.B.’s), certainly did not expect a ‘picnic’ and probably at the time it was better to think of nothing but ‘getting there’. Mr Jackson, the owner, simply wanted his yacht brought to Sydney, where he had gone to live permanently, and these men took on the job of sailing her to him as an ordinary workaday business. Shortly after sailing, however, they found that the “Psyche” had not been properly prepared for the long voyage. In addition to that she sailed into such tempestuous weather it was wonderful that she arrived at all. Mr Jackson had many anxious hours as he watched for the “Psyche” near the Sydney heads during the time she was at sea. N consideration of the phenomenal gales that were then raging over the Tasman even liners had remained in port rather than risk the dangers of the open water. One vessel was disabled and had to be escorted to a harbour by destroyers. Nor was the owner any more comforted by the reports from every station telling of the terrifying conditions to be seen from all points along the eastern Australian coast. What a sublime shock it must have been to him when, on the morning of the 23rd April, he suddenly descried the “Psyche” coming into view of Port Jackson in full racing rig! That such a frail combination of canvas and wood had been directed through a particularly nasty stretch of sea in possibly its deadliest temper was the incredible truth; the crew truly merited all the honour and admiration they were given upon anchoring in Watson’s Bay. The “Psyche” was 45 ft overall, with 11 ft beam, 10 tons displacement; was powered with a 20/25 horse power Atlantic engine, burning benzene or kerosene for fuel, and with the engine, had a speed of 8 knots. The following is taken from the Australian Motor Boat and Yachting Monthly. In this little vessel on April 3rd the adventurous voyage started. Here is the crew’s story. “We slept on board the night previous to sailing and a t 4.30 a.m. next morning had her ready for sea. At 7 a.m. we cast off under power and set staysail and mainsail. Passing Point Ha[l]swell we put the kettle on to boil on an oil stove. We ran down to the Heads and crossed Lyall Bay, doing about 9 knots with the wind a freshening nor’wester. Tony and George Jackson, sons of the owner waved us Godspeed from the headland. And we replied full of confidence. Getting near Sinclair Head, the kettle started to boil after one and a half hour’s effort. Tea was made, but the stove was not even in a gimbal, and as we ran into a fairly heavy rip, over went the lot. A fair amount of water also came below as the ship was not properly battened down, and the skylight and ports were leaking through not being covered. She had been on the ‘hard’ for twelve months and the decks were opened up with the weather. Another and heavier rip was struck off Terawhiti, where a case of gas went overboard. Fortunately the crew were all hardened yachtsmen and the weather had no effect on them. The ship was a lively as a cricket, and the old skipper, who is now 71 and not as active as he used to be, was thrown all over the place. A fine old man, hale and hearty, we could not wish for a better to sail under. Under the lee of Wellington Head we decided to straighten up a bit, and we lashed things down in preparation of the nor’west gale and heavy seas that promised. Just here we passed the Brothers Lighthouse and the Picton steamer Tamahine to windward. The weather was very bad and a lot of water was coming down below. Our next task was to take the mainsail off, and a hard and wet job it proved. After much cussing and swearing we succeeded, when the engineer informed us that the pumps had become blocked. He took them down seven or eight times to clear them, with the water lapping around his waist, but eventually had to give it up as a bad job. The bilges were also full of coal ashes out of the small Dover stove. For some time after we could only get the engine to run on two cylinders. We tried to make through the northern entrance, but could not make enough headway. Consequently we had to run back to Tory Channel and just got in as the tide was changing. Here the tide runs in and out of a quarter mile entrance, with the engine giving trouble all the way, arriving at 9.30 p.m. Here Archie, with unpleasant memories of the oil-stove’s feat in boiling kettles, borrowed a spare primus from Mr Jack McLean, who was anchored nearby in his fine auxiliary ketch RESTLESSNESS. Jack, by the way, wouldn’t believe that we were bound for Sydney! What a relief it was to get a hot drink! Unfortunately half our stores were ruined through kerosene leaking, but they had to be given a passage. All hands now turned in dog-tired and wet from truck to keelson after a run of about 100 miles. Next day, Sunday, April 4th, we turned out early for a heavy day of cleaning, plugging up leaks, battening down skylights, hatches etc. Mr Jackson’s household linen, cushion covers, etc., that were stocked in the lockers were found to be soaking, so we bundled it all up in two potato sacks and marked it for shipment back to Wellington. We then went ashore for a good hot feed at the hotel. Everything and everywhere was shut down, even the Post Office, on account of the Easter holidays and we were unable to send telegrams. Our fresh meat had gone bad, the onions were soaked in kerosene. Visions of steak and onions had thus become a memory and we had to be content with sadly burying the departed at sea. On the fifth we were out bright and early and spent another morning getting the ship into condition for the trip that should have been done at Wellington before we joined up. We tried heeling her at anchor to plug up the lavatory which was leaking badly, but could not get over far enough. We then went alongside the wharf and heeled down on throat halliards. Later we went ashore and had dinner and bought more stores. Then we went over to the T.S.S. Tamahine and shipped back all the wet linen. We sailed for Ship Cove, 17 miles away, under power at 2 p.m. Here we found the batteries, which were all new before sailing, running down. A ‘shorted’ wire was found down in the bilges, almost eaten away with kerosene and water. How in the name of fortune anyone ever came to wire the ship through the bilges had us beaten. Next day we turned out at 6.30, and after a breakfast and run ashore for a wash in the creek we took a photo of the engineer (hereafter known as ‘rastun’) and Archie aloft on Captain Cook’s monument – and a handsome pair they were too. The weather was beautifully fine with slight southerly and high glass. The dinghy was lashed to the deck once more, and we hove up anchor and sails, and started away under power at 9a.m.We passed Mr Arthur Holmes’ fine new cruiser on its way to the fishing grounds. Jackson Head was abeam at10.30. There was very little rip and less wind. A nor’-west course was set and Stephen Island was passed at 1.30. As we had no flags or signalling gear, we could not call the station and report. More trouble came our way, for we found the generator was not charging. It was burnt out somewhere on account of being underwater in the Straits. The switch board, volt and ommeters were taken to pieces, but were found to be out of action through water. The mainsail was lowered off Blind Bay. There was a moderate S.W. swell coming up rounding Farewell Spit, but no wind. The course was altered to N.W.W. Stephen’s Island Light was dropped at 7p.m. 32 miles behind. On the 7th the crew started 4-hour watches. ‘Rastun’ had the engine running all night. It had been running 21 hours without stopping, and then only to change the plugs, as kerosene had been used. There was no wind all night. During the day there had been a light sou’west breeze, so we had the mainsail up all day., only to take it down again at nightfall. Sights at noon placed us abeam of Cape Egmont, but seaward about 80 miles. The log for 27 hours showed 117 miles. The barometer was steady, but there were a few light rain squalls. Next day brought a steady barometer, with no wind again, and a light swell. The engine was still going strong at quarter speed to save fuel. ‘Rastus’ had the generator to pieces for the second time but met with no luck. The batteries were now flat, and we only had one hurricane lamp aboard. There were no oil navigation lights, excepting a small binnacle lamp, that, with luck, would burn for six hours at a time. Saddest of all was the discovery t this stage that there were no tinned fruits of sauces aboard. All we could find was army ‘hard tack’ and ‘iron rations’ which, of course, had to do for the rest of the trip. The ship was taking a fair drop of water in after having been on the slips for so long. The engine water circulating discharge was also leaking out through the exhaust into the bilges. Midday found us 350 miles from Stephens Island, with the course set nor’-west. April 8th broke with a light nor’-wester blowing. There was a moderate swell, but no sea. The weather was perfectly fine and we were still under power. Sights and log at midday showed that in 24 hours we had done 125 miles with the engine. We had plenty of odd jobs to do during the day. One can always find employment at sea the main job being to get enough sleep. We were still on watches of 4 hours on and 8 off. Quite long enough too, when you do the midnight to 4 watch at the wheel. The engine stopped at midnight on April 8th after continuously running for 3 ½ days. At 2 a.m. we had to start it again, as there was no wind and the jobble of the sea was throwing the boom all over the ship. A light northerly sprang up at 4 a.m. and the engine was stopped once more. The breeze freshened all day and a lump sea was running. The skipper had some job to get the sights as the boat was very lively. The weather wire topping lift carried away, and Archie and Les had an exciting time aloft. The weather was very threatening and heavy rain squalls were falling. Nasty beam seas were rising, making the ship dance like a cork. A large school of whales was passed at 4p.m. Two reefs were put in and we snugged down for the night. The confounded weather topping lift broke again, and Archie and Les nearly lost their tempers. The rest of the original articles published in the Australian Motor Boat and Yachting Monthly issues of June, July, August 1927 here: http://anmm.smedia.com.au/olive/am3/anmm1/. The Articles come under the heading "Ocean Rovers". Small Stuff by Gavin Pascoe is licensed under a Creative Commons Attribution 3.0 Unported License. Based on a work at http://wgtnclassicyacht.blogspot.co.nz/. Permissions beyond the scope of this license may be available at http://www.wcyt.org.nz/. Full attribution to images used can be found at our website. Gavin Pascoe. Simple theme. Powered by Blogger.